The Ricardo100 Global Challenge around the world charity relay returned to the UK yesterday – having circumnavigated the world through Europe, India, China, Japan and the United States – and started its Scottish leg with an event at the Glasgow Science Centre. The Ricardo100 Global Challenge is being run as part of the company’s celebrations of the 100th anniversary of its formation in 2015. Teams of Ricardo employees are taking part in sections of the relay using vehicles of significance to Ricardo’s past and present, visiting places of significance to the company, as well as events such as yesterday’s launch of the Scottish leg at the Glasgow Science Centre. The teams are raising money for local, national and international charitable causes, and Ricardo has pledged to match the first £15,000 in total donations. 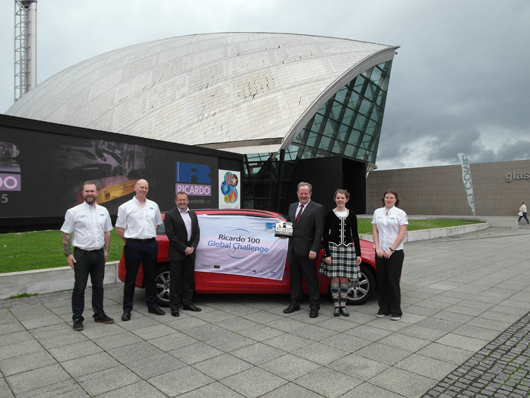 Scott Hamilton and Susannah Telfer of Ricardo-AEA’s Glasgow office took to the wheel of a Volvo V60 DRIVe for the journey from the Glasgow Science Centre commencing the first leg of the Ricardo100 Global Challenge since its return to the UK. This is a car with exceptional fuel economy and very low CO2 emissions that was developed in collaboration with Ricardo, so it is very apt that both Scott and Susannah are key members of Ricardo-AEA’s air quality team. In doing so they have already raised £1,400 for their own selected charities: Chest, Heart and Stroke Scotland, Cancer Research UK and Alzheimer’s Research UK. As a further celebration of its 100 year anniversary, Ricardo is establishing its Centenary Bursary initiative. Commencing this year close to its headquarters but planned to be extended to other Ricardo sites, it will provide financial support to students in greatest need, to further their education, whilst also encouraging more young people to study STEM subjects which are at the core of Ricardo’s passion and expertise. A full copy of this press release and an accompanying high res images are available from the links at the top right of this page.